Welcome to the Mycological Society Mushroom Cultivators' Group Website. We are amateur cultivators who meet periodically to share experiences and expenses. The group consists mostly of members of the Olympic Peninsula Mycological Society and the Kitsap Peninsula Mycological Society, however, you need not be a member of either Society to become part of our group. When I am not too busy doing carpentry, I make Pleurotus straw blocks available for sale. If you are interested in providing an indoor, controlled environment for your mushrooms, this species will reward you for the effort. is a tropical mushroom that fruits in two weeks at room temperature. These make so many spores that you would not want to have them in the house with your family. Most hobby growers of these pink beauties use a plastic tent in a heated room. People who want to cultivate mushrooms outdoors may want one of the terrestrial species our group is growing. Our members grow shaggy manes and the garden giant. 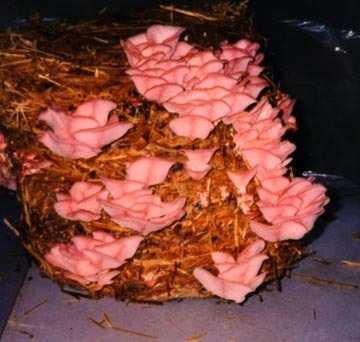 This site contains a document with details on how to grow oyster mushrooms. I have another website that site with details on how to make straw blocks to grow oyster mushrooms. Kitsap Peninsula Mycological Society member Art Fick has compiled mushroom recipes that are available in pdf. Click here to download recipes for Pickled Coral mushrooms, Pickled Mushrooms, Mushroom Scramble, and Chatterelle Soup. Click here to download recipes for Breaded Puffballs, Dried Mushroom Soup, Mushroom Casserole, and Meaty Mushroom Chili. You can learn how to grow edible mushrooms at home. Our cultivation events take place on the Olympic and Kitsap Peninsulas, but of coarse, we can do this anywhere. If you live on or near the peninsulas, you can receive invitations to local mushroom cultivation events. Please include the words: "subscribe, cultivators' list" in the subject window. If you would like us to bring a mushroom cultivation workshop to you, please include "cultivate mushrooms in _______?" in the subject window; replace the blank space with the proposed venue. Note: the shiitake in this photo was grown on the planet in the background. This site created and maintained by Lowell Dietz. Mushroom cultivation is my hobby. I make my living doing carpentry in Sequim. You may view my carpentry website at:http://dietzfarm.com/carpentry.html.